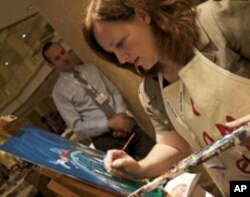 After losing her husband, Fred, to cancer last year, Regina Holliday immersed herself in painting. Holliday has always been an artist. But she never dreamt that one day she'd be painting images of her husband as he was slowly dying. Fred initially did not have insurance. However, after he did acquire it through a new employer, the doctors were still dismissive, according to Holliday. She says Fred repeatedly went to his doctor to find out why he was experiencing severe chest pain. But rather than do any diagnostic tests, his doctor kept sending him home with pain killers. After several months of debilitating pain, Fred was finally admitted to the hospital where his wife demanded an MRI. The test revealed Fred suffered from an advanced form of kidney cancer. His doctor recommended surgery and chemotherapy treatment, but Fred never received the care he was promised. Instead, his doctor sent him home with a PCA pump, a device that patients use to self-administer medication to control pain. "I'd done my research," says Holliday, "I knew what being sent home on a PCA pump was. And my husband cried, and I cried and then he turned to me and said, 'Go after them Regina. You make sure they give me care.'" Holliday says Fred had been an excellent patient up until then. "He never complained, he never made waves, he always did exactly what he was told, but the point when they were going to send him home to die, that's the point when he said, 'Try to do something.'" Holliday arranged for her husband to be transferred to a new hospital, but says Fred was unable to get the care he needed there because his medical records were incomplete and out of date. Artist Regina Holliday, who lost her 39-year-old husband to cancer in 2009, plans to use her tragedy to change the world of medicine. Holliday says she stayed up nights wondering what she could do to raise awareness about the inadequacies in the healthcare system, so that families like theirs wouldn't be treated that way. "Since I've painted my whole life and since I met my husband painting and we'd always painted together, I thought, 'You know what I can do? I can make really good paintings, about healthcare, about medical records, about all of these things that have been so hard for us,'" she says. But for Frederick Allen Holliday, it was too late. He died on June 17, 2009, at the age of 39. Six days after her husband's death, Holliday started painting a mural about their medical experience on the wall of a parking lot near their home in Washington, D.C.. It was the summer of 2009, a time when the national debate about health care reform was intensifying around the U.S.
As word about her mural spread around town, Regina was inspired to join the health reform movement. She used the example of her own personal experience to make the case for reform, which played an integral role in a newly passed law that stipulates greater patient transparency. She also continued to paint, integrating her political message within her images. Many of those paintings were on display recently in an exhibit at a medical office in downtown Washington. While the response to her political art has been mostly positive, Holliday does have her critics. "A lot of people don't like to accept the idea that something is wrong. Like, America has the best medicine. Well, in elements we do. We do have some of the best medicine. But in other elements, we don't. And honestly, if one cog in this machine is not working, everything fails," she says. Today, Holliday continues to paint, blog, teach art and speak nationally at medical conferences about the need to reform our healthcare system - all while raising two young boys. Despite the challenges in her young life, this artist-turned advocate says she is pleased that she has been able to use her personal tragedy - together with her artistic talent - to raise awareness and bring about change, to the important issue of patient empowerment.